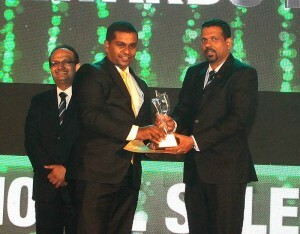 Adrian Samarasekara, Deputy General Manager Modern Trade LAUGFS Gas, clinched the Silver Award and was ranked among the top two sales strategists in the local sales arena. Meanwhile S. M. Muslih, Area Business Development Manager LAUGFS Gas, secured the Bronze Award in the Territory Manager category. “As a truly Sri Lankan energy company gaining recognition at a nationally acclaimed award ceremony is an immense prestige. Adrian and Muslih have been supporting LAUGFS Gas’ sales team as the company grows from strength to strength and expands its business. Being a trusted energy company that is leading and pioneering industries, these awards recognise the dedicated sales professionals while inspiring them to realise their potential. At LAUGFS Gas, we consider our employees to be one of our greatest assets and these achievements reflect their commitment to our organisation.” He further elaborated.